Megan J. Laverty’s paper focuses on rhythm or the patterned and recurrent alternation of sound and silence that we find in music and its relation to education. She considers the broader existential significance of this phenomenon using Dewey’s aesthetic philosophy. Laverty argues that if Dewey is right that (a) music exemplifies artfulness and (b) to live well is to live artfully, then an education in music—formal and informal—constitutes an education in how to live well. Artfulness, according to Dewey, involves, the intelligent harmonizing of the precarious, novel and irregular with the settled, assured and uniform. Laverty explains what Dewey means by intelligent harmonization and contrasts it with those occasions when individuals act from enforced necessity, routine or blind impulse. 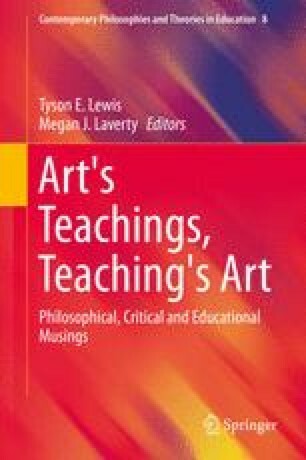 Laverty offers an intrinsic justification for arts education that focuses on a quality not previously highlighted by Maxine Greene and others. Clearly humanist, Laverty thereby aligns Greene with other post-humanist contributions by focusing on an iterative process constitutive of our material condition. The aim, as with so much of post-humanism, is not to control or direct this process in the interest of a telos, but to vibrate possibility. An abridged version of this chapter was presented as an invited keynote presentation at the International Philosophy of Music Education Biennial Conference, Teachers College, Columbia University, June 6, 2013. I am grateful to the participants at that conference for their comments. I would also like to gratefully acknowledge the students who participated in a doctoral seminar on John Dewey’s philosophy. Conversations with Guillermo Marini and Jason Wozniak have been particularly instructive.